Running Press Adult, 9780762492466, 240pp. The book Food in Jars readers have been waiting for: 140 recipes for the preserving kitchen, helping you use up your homemade pantry! With chapters focusing on great ways to use preserves throughout the day and for every meal, readers aren't required to have a specific preserve on hand to work, making this cookbook flexible and easy to use for both experienced and novice canners. As one of the most beloved voices in canning and preserving, Marisa serves as a kitchen muse to help each reader complete the cycle of empty jar to empty jar. 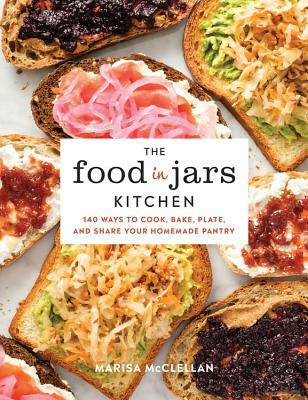 Add The Food in Jars Kitchen to your collection, an inspired workhorse of delicious eats. Marisa McClellan is a full time food writer and cooking teacher, and has been blogging about canning, pickling, and preserving on her blog Food in Jars (three times nominated by Saveur magazine for a Best Food Blog award) since 2009. She has published three books about canning, including the bestselling Food in Jars. She lives in Philadelphia with her husband. full of flavor. But The Food In Jars Kitchen might just be my favorite one yet. preserves. Buy this book for yourself and the canning enthusiasts in your life.